When I was a child (which was a long time ago), my window on the world was through books. One day my Dad came home with a gift from one of his teaching colleagues. What a wonderful gift it was! It was a beautiful, old (even then) complete set of the Encyclopaedia Britannica! The car seemed to be full of these big, heavy books, beautifully bound with gold lettering. I was about 7 at the time, and each book seemed to be as big as I was, but being a determined and independent child I still struggled in with volume after volume. We lined them up in alphabetical order in the corner of the lounge, leaning up against the wall. I picked one out at random to look at. By sheer chance it opened at an etching of a man standing on top of a rock arch. I can still see it as clear as day in my mind’s eye! I was hooked! I already had an obsession with collecting stones and shells (what child doesn’t?) but from that moment I wanted to find out everything I could about the world around me – my way was to spend hours sitting on the floor looking through these fantastic books. Nowadays most of us can just open the computer and browse the internet – the biggest single repository of information that has ever existed. However, the JOIDES Resolution knows that by opening the world to young people in a truly interactive way, it can push their learning experiences way beyond pictures or text. And any teacher will tell you the same thing – that real world experiences make a huge difference to the achievements of young people. If they can see what there is to aim for, the exciting and endless possibilities that await those who get up and go for it, they will respond positively and look beyond their current horizons. Whilst it would be wonderful to give students the opportunity to actually visit the ship, being taken on a real-time tour is the next best thing, and we can do that for them. Schools can link up through various video-conferencing software and, with the use of a tablet, we can walk around the ship, onto the bridge, through the labs, onto the catwalk (where the core arrives) and look across the drilling deck. We can let students ask questions of the scientists and other people working on ship, from engineers to cooks! If we leave students wanting to taste more of the excitement of discovery, then that is a good thing. Any entertainer will tell you that you should leave your audience wanting more, not satiated. It is a really good way to keep your students learning, engaged and excited! Using the internet like this is a great way of bringing people across the World together, breaking down boundaries and allowing the mixing of ideas and cultures and knowledge, and also firing ambitions. It makes the world a much smaller place! 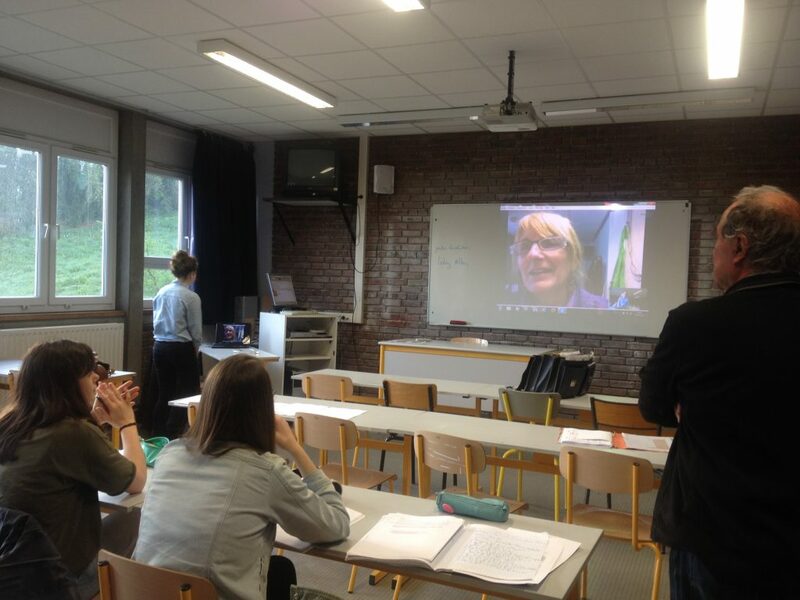 Last week I did an outreach session with a school in France. Whilst the videoconference was happening, and students were coming up to ask me direct questions in turn, someone in the classroom took a photo of me up on the whiteboard and then emailed it to me within a few minutes of the action! It was very weird for me to suddenly have a picture of myself teaching students 6000 miles away, just five minutes earlier! In my youth it would have taken months of planning and travelling (physically) to be able to teach someone else in ‘real time’. Now the world is literally there at the touch of a button, and the JOIDES Resolution is determined to use this opportunity to democratise their science by bringing it to anyone who wants to be involved.